It’s the first day of Holidailies and here I am typing as fast as I can so I can get this posted before midnight, and thus not fail on the first day, which would be really inauspicious. It’s warm here today. Warm and muggy, and not Christmassy (Or Hanukkahy) at all, though the sky teased us with storm clouds that didn’t deliver. I don’t mind the warmth – it’s cool enough to not need a/c but warm enough to also not need heat – rare for Texas at any time of year. But I miss that smell, that magical SMELL that comes when the night is crisp and cool, and the stars are particularly sparkly. It’s the combined scent of chimney smoke and fallen leaves, damp earth and leftover turkey. It’s the fragrance of nutmeg and peppermint and crinkly tissue paper. And when it’s this warm, this balmy, you just can’t smell it. So I go through the motions. I take the plastic, pre-lit tree out, and let it rest in the house (because even plastic trees need to rest before you bedeck them with ornaments), and I open today’s door on the Advent calendar, which reveals, ironically, the image a star shimmering in the night sky, and I wait. Because I know that soon enough the temperature will drop, and the skies will deepen, and that wonderful seasonal aroma, the one that smells like love and innocence and magic and anticipation, will ooze its way back into my perception. 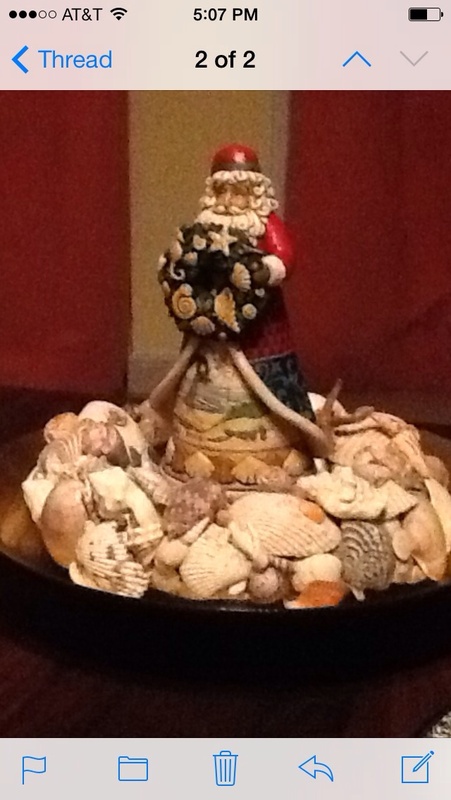 Today’s Santa: I gave this to my mother four years ago. Purchased in Ocean Grove, NJ, October 2009.